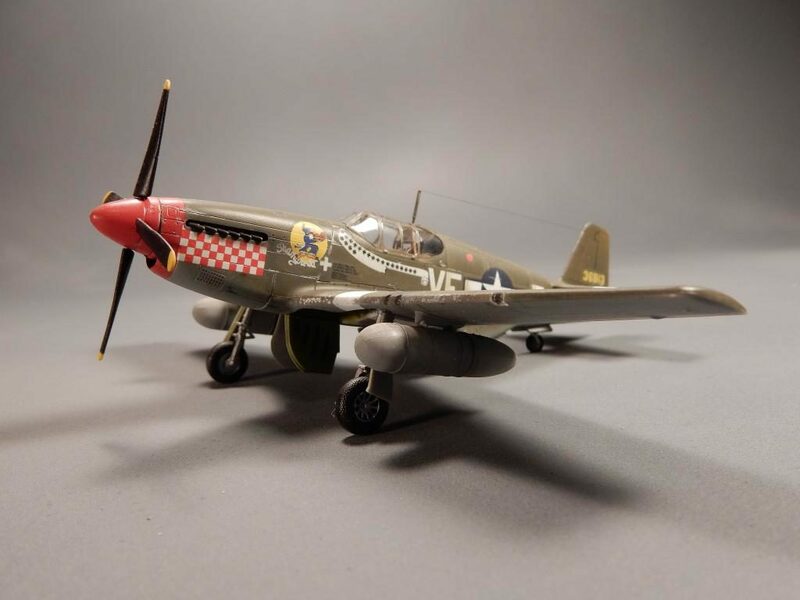 Most of us who build World War II aircraft, started out being interested in the ace’s. 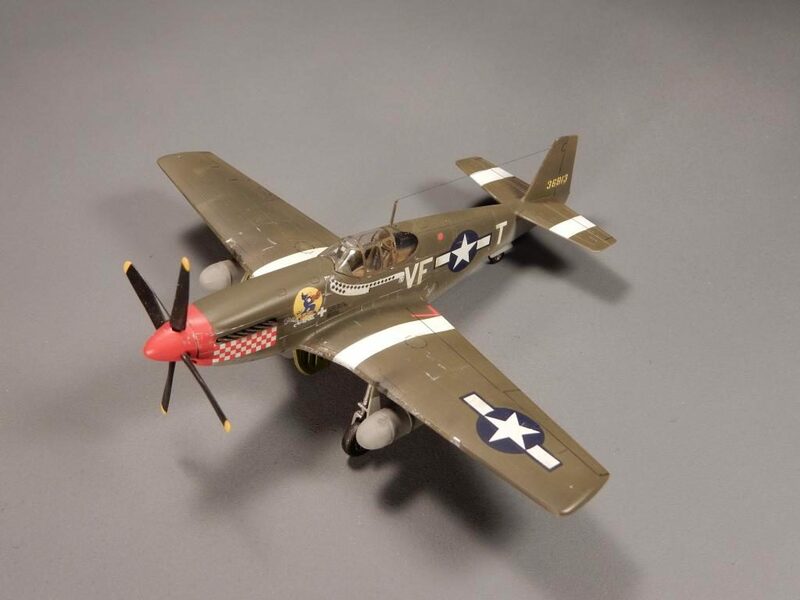 Therefore most of us have cranked out a Don Gentile “Shangri-La” P-51B. As the story goes, Don Gentile slammed his beloved aircraft into the runway, doing victory rolls, after matching Eddie Rickenbackers record. 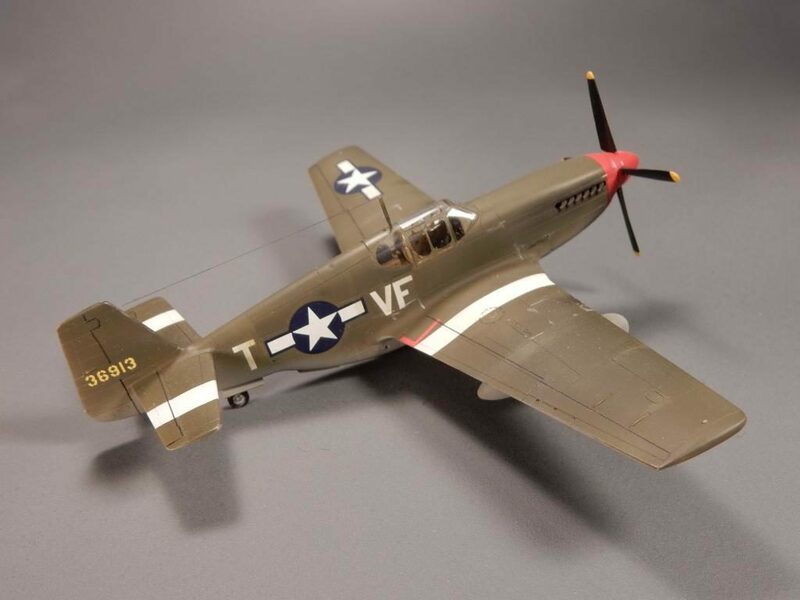 The remains of this aircraft were pushed into a nearby pond, and Gentile was sent home by his ticked off commander. Who, in actuality probably sent him home to sell war bonds and get him out of harms way. I always wonder if the remains of this aircraft are still in the bottom of some pond on a British dairy farm. I actually built this model a long time ago, and like most of us model guys, keep something around for a test bed. This is mine !. I’ve practice a lot technics, such as paint chipping with silver pencil, panel shading and trying out a new airbrush. My first attempted making seatbelts out of leaded foil from wine bottles and building the buckles from wire. Drilling out the gun barrels and stretching sprue for antenna wire, and the list goes on, yet, with all this practice on this model, I’ve somehow managed not to destroy it.. So, with all that, I present to you, not my best model, but one of my favorites, due to the simple fact it not only outlasted the actual aircraft it represents, but everything I’ve thrown at it, I still like well enough to keep it displayed on the shelf. This is a nice result, Terry. Photos are good as well. 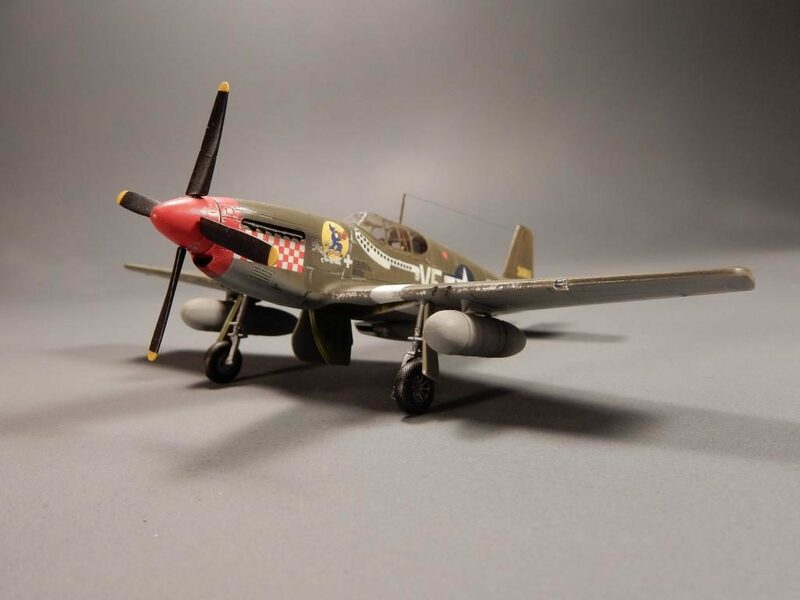 Thanks Rob, I too love the B version, actually I love anything P-51, and thanks for the photo comment. I tried a few new things that seem to have turned out well. Its a little tough photographing these little guys. Love your article Terry and the mustang looks great as well. Nice to see an old Vet, still on the shelf. Looks pretty good, too. That would be cool !!!! I still have one I built in 1978. 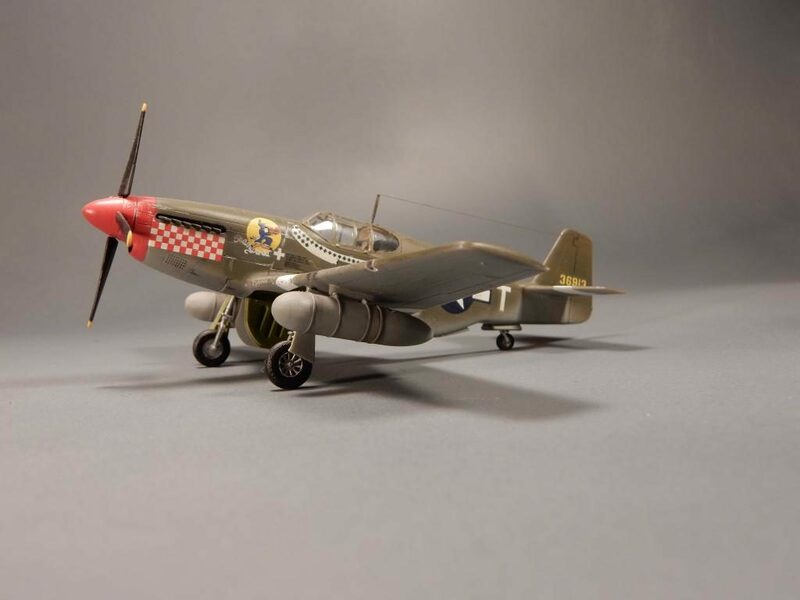 It’s an old 1/48 scale Otaki Ki-44 “Tojo”………………..
but I “restored” it several years ago. The one I kept for practice is the old Monogram Fw-190. It’s had many layers of paint …….. (warts and all). This build brings back some memories !!!!!!!!!! 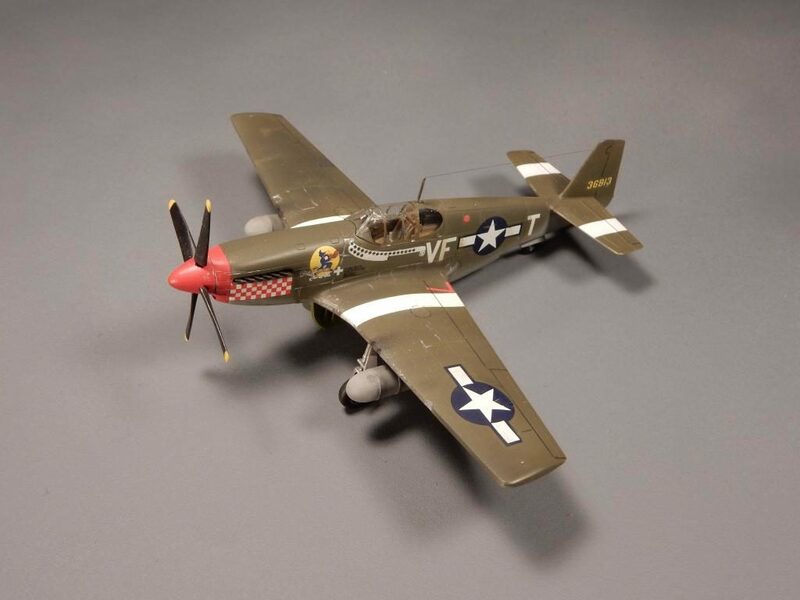 When I was a kid I built the 1/32 scale Revell P-51B. Back then it came with markings for Don Gentile’s Mustang. Still to this day this has to be my favorite paint scheme for a B model Mustang. Cool story as well. I didn’t know that the plane was pushed into a pond……. Maybe someone needs to do some detective work……… That would be an awesome discovery if it was still there submerged. I like it !!!! Excellent in all aspects, both the model and the article. Two thumbs up !!!! Thanks Louis, I built this model around 16 to 18 years ago. It was a gift from my son. So it does have some sentimental value. From what I’ve read, I believe they bulldozed it into the pond, I’m guessing it was pretty tore up. It would be fun to at least retrieve the nose art from it. Nice work, Terry….it’s stood the ‘test of time’ very well indeed. And like Rob said, the photos are well done. Thanks Craig. I even dropped it once, catching it before it obliterating into the floor. but causing a lot damage and thus repair. Its a neat little kit, has a great looking spinner (unlike their 1/48 version that has a blunt looking spinner), and a lot of nice features, making it nice little kit. Excellent ! Thank you Terry. Looks great. nice razor back! Gentile was already set to go home on a war bond tour. Don Blakeslee had a rule, “He who prangs his kite goes home.” If you had an accident resulting from pilot error, you were out. Blakeslee was prevented from doing that when 8th AF public relations told him “We’re not sending the top ace home in disgrace.” He never forgave the media (as I discovered first hand trying to get an interview with him 35 years ago) for that. The controversy over Gentile was that he and Godfrey often verified each other’s claims, which others in the unit didn’t believe (40 years later the controversy still raged with survivors of the 4th FG). He only “beat” Rickenbacker’s score when “ground kills” were added in to his aerial victories. This was controversial since no other command but 8th AF did it (they were doing it to convince pilots to engage in strafing, which was far more dangerous than air combat, since it changed things from a contest of skill to the laws of chance). 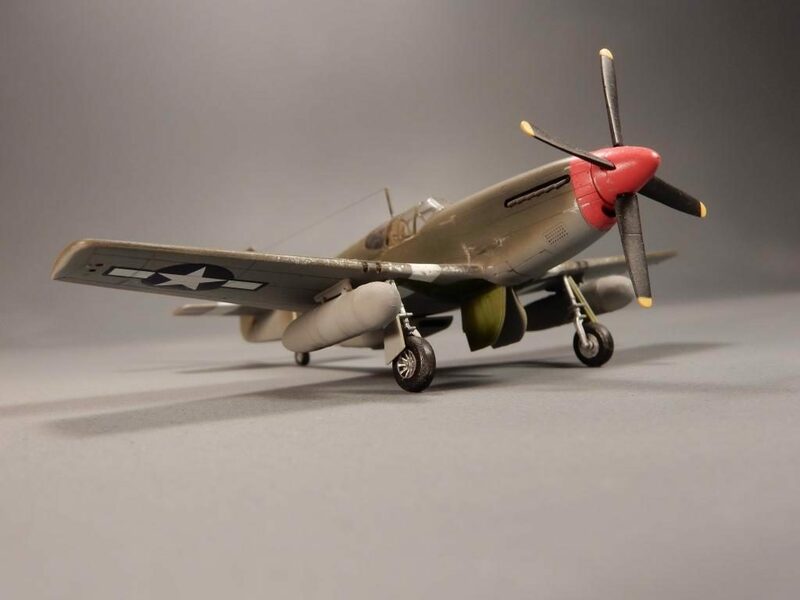 Interestingly, on his final mission, Gentile had the chance to shoot down three i****s flying along like three blind mice, but just as he started he heard a radio call for help and went to do that – which was unsuccessful. Many have attributed the crash to oxygen starvation as he came down from high altitude. 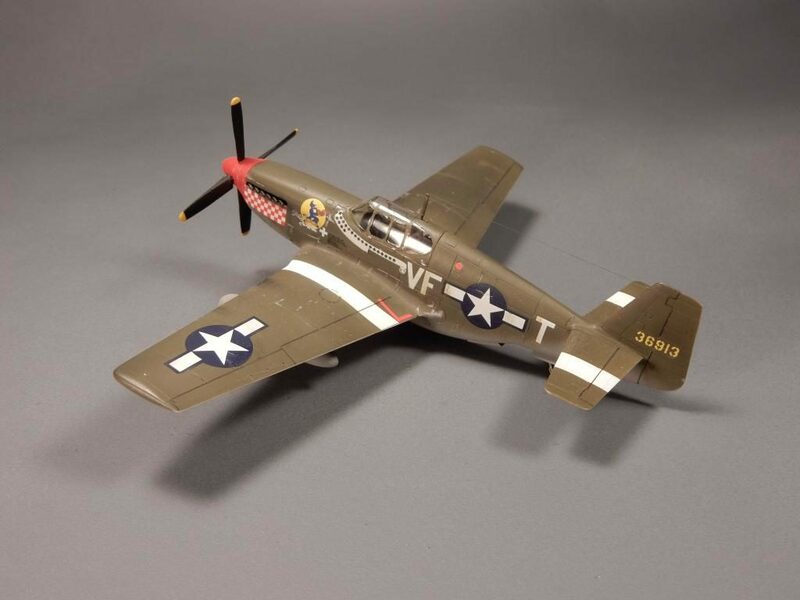 No, the Mustang was never found in a pond because it was never put in a pond – one of the many myths of WW2. Way to go Tom, You ruined a perfectly good rumor, I’m sure Rob Pollock already had his mask and snorkel out, ready to go treasure hunting in the British county side ! To be honest, I always had my doubts about the pond story even though its mentioned in one my books. But one has to wonder what really happened to the nose art ? Looks great !! I did the Malcolm Hood “Old Crow”,same brand and scale. Love it! Even after all of your experimenting, she still sits proud and looks great. Would be proud to have it in my display case as well! Well, it still looks good after all your “experimenting”. It’s nice to see an old warbird like yours looking so good after all that work. Good looking ‘planes never grow old! Well done Terry. Looks good to me Terrry.